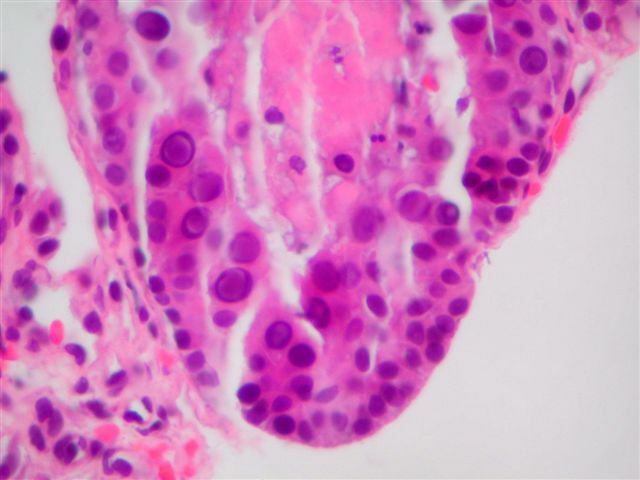 A 56 year old man had a history of CD20+ (B cell) CLL since 2002.� He received Rituxan (anti-CD20) and Fludarabine and went into remission.� In 2005, he relapsed, and his CLL was now CD20 negative, but CD19+, CD23+ and CD5+.� He was treated with Campath (anti-CD52), and went into remission again.� He later developed dysuria and hematuria.� Cystoscopy showed an erythematous bladder.� Multiple biopsies were obtained. 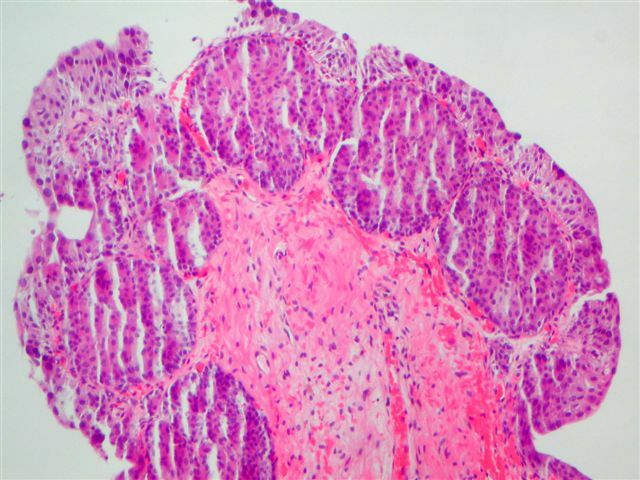 The diagnosis was confirmed by an immunostain for SV40 T antigen, which was strongly immunoreactive. The polyoma viruses are nonenveloped double-stranded DNA viruses (Stanford University website).� The polyoma BK virus is widely present in healthy individuals, and may be latent in the kidney, central nervous system and B cells.� Other polyoma viruses are JC, which causes progressive multifocal leukoencephalopathy, and SV40, which causes only subclinical infections.� The antigens of these polyoma viruses cross-react serologically and functionally, although they are distinct. 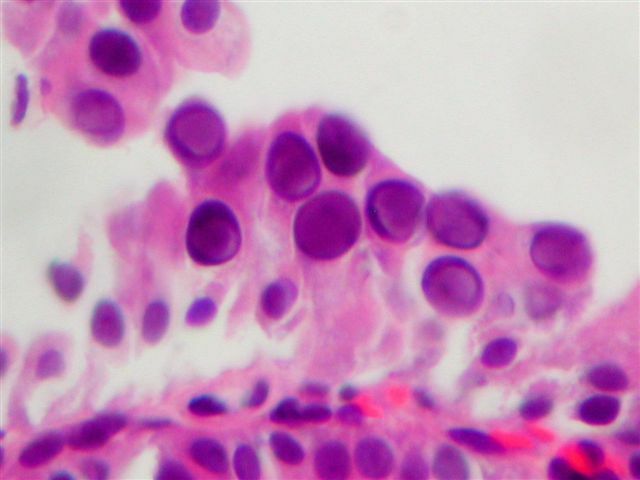 Immunosuppression may reactivate the latent virus, and cause hemorrhagic cystitis with the presence of decoy cells, particularly in bone marrow transplant patients.� Urine cytology shows cells with enlarged nuclear and homogenized chromatin due to viral inclusions (image).� These cells have the same appearance as in our case, and are similarly immunoreactive for SV40 (image).� Electron microscopy shows 40 nm sized particles (image).� A recent study has found an association of BK virus in immunocompetent patients with bladder carcinoma, with a 3.4 odds ratio (Diagn Cytopathol 2006;34:201).